SGT Ralph B. Lawson enlisted in the United States Army on 6 July 1938, and was assigned to the 2-l8th FA, a horse-drawn artillery battalion. In December 1938, 2-18th FA transported over 800 horses and equipment 400 miles from Fort Sam Houston, Texas to Fort Sill, Oklahoma. The trek took over five weeks to complete. In 1940, he then transferred to the 74th Field Artillery in Fort Ord, California where he rose to the rank of Sergeant and was discharged from the Army on 9 July 1941. One month later, SGT Lawson reenlisted in the Army and was sent to Camp Roberts, California where he trained on driving heavy trucks. Upon completion of that training, he was sent to Fort Warren, Wyoming where he was assigned to the 183w Field Artillery, an Idaho National Guard Battalion. SGT Lawson requested a transfer and was sent to the 98th Mule Pack Artillery at Camp Carson, Colorado where they trained with the 10’ Mountain Division. In September 1943, SGT Lawson volunteered for a dangerous mission; to participate with the 98th reconnaissance and intelligence platoon’s operations in India and Burma. That unit was commanded by Frank D. Merrill, later called “Merrill’s Marauders.” On 22 February 1944, the 5307th along with SGT Lawson, became the first U.S. ground combat force to fight on the continent of Asia in WWII. SGT Ralph B. Lawson is one of the few surviving horse-drawn artillery Soldiers. He fought in three major battles and 32 minor engagements. His awards and decorations include: the Bronze Star, the American Service Ribbon, the American Defense Ribbon, the Asiatic-Pacific medal, the Combat Infantrymen’s Badge, the Good Conduct Medal, the Presidential Unit Citation, and the China Victory Medal. On 18 September 2004, Mr. Ralph B. Lawson was inducted into the Oklahoma Military Hall of Fame. Mr. Ralph B. Lawson has been married for 60 years to the former Mrs. Ida Bell Estep and has two sons. They now reside in Catoosa, Oklahoma. Hover mouse over picture for larger image. 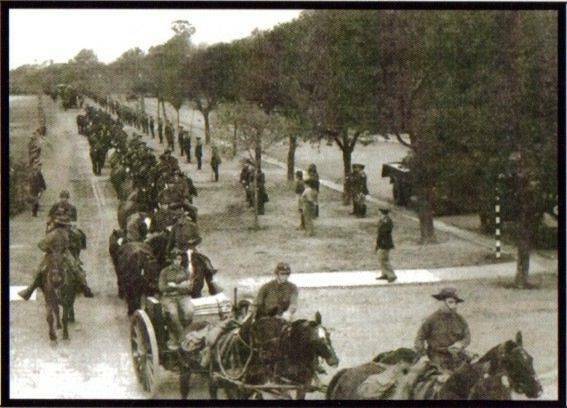 PVT Lawson on the lead team of horses as the 2d Battalion, 18th Field Artillery departs from Fort Sam Houston, Texas with over 800 horses and equipment on a five week journey to Fort Sill, Oklahoma. Click here to read more about Ralph Lawson and see pictures of Ft. Sill back then as well as the 98th Field Artillery Pack group photo, and the Battery C 74th FA. class photo page. "In September, 1943, President Roosevelt issued a request for volunteers for a dangerous and hazardous mission. Ralph was among 129 members of the 98th that volunteered." By the time they got finished running horses to Fort Sill, the horses has ribbons tied to the tails and mains. Ribbons on the main indicated the house was a biter, and ribbons on the tail indicated the horse was a kicker. The Lead horse that Sgt. Lawson was riding was numbered 666 in the army's inventory. Sgt. Lawson wants everybody to know that, contrary to religious references to the number, that horse was a good horse!